Cassava when planted as an intercrop along with cowpea or groundnut in tree crops like Eucalyptus and Leucaena reduces soil run-off and soil-loss. Forage yield of Leucaena improves and results best growth on Eucalyptus (in terms of girth size) when grown with cassava + groundnut (Ghosh; et. al., 1989: pp. 67-82). Canavalia or crotalaria (legume crops) when planted as intercrops with cassava improves soil productivity. Sow 1 row of Canavalia or crotalaria between rows of cassava immediately after planting cassava. Let these grow until harvest. Plow-under to incorporate into the soil (CIAT, 2000). Cassava grows rather well on poor soils but to produce high yields the crop requires large amount of nutrients. To maintain high yields, it is necessary to maintain the fertility of the soil. Some Asian farmers apply 5-7 tons of manure in a hectare. The application of nutrients to cassava soils in the form of animal manure and through intercropping with grain legumes play significant roles in increasing cassava yields and maintaining soil fertility (CIAT, 2000). The cassava plant can be maintained as a semi-perennial forage crop for at least 2 years provided there is fertilization either with goat or pig manure (Sopheak, undated). Application of NPK at the rate of 60-60-120 kg/ha can significantly increase cassava yield (Cong, 2001). However, fertilizer recommendations based on soil analyses provide the very best chance of getting the right amount of fertilizer without over or under fertilizing. Ask for assistance from local agriculturist office for soil sampling and soil analysis procedures. 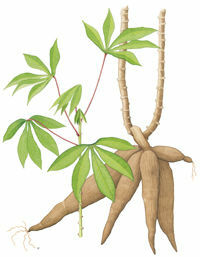 The cassava plant has toxic compounds (cyanogens) in its tubers and leaves. Improper preparation of cassava for food should be avoided. Boiling and drying make cassava safe for consumption. Grating, fermenting, and sun-drying are other effective methods. CGIAR. (1997): Centers declare victory over the cassava green mite. CGIAR Newsletter. Vol. 4, No. 4. CIAT. (2000): Cassava. Asian Regional Program. DA. Chatuchak, Bangkok, Thailand. Cong, P.T. (2001): Upland cropping systems in Vietnam. Institute of Agricultural Science. Hanoi, Vietnam. IITA. (2000): Integrated management of cassava pests. Highlights of Project No.10. IITA 99 Annual Report. IITA-Benin. Siritunga, D.; Sayre, R. (2004): Engineering cyanogen synthesis and turnover in cassava (Manihot esculenta). Plant Molecular Biology. Vol. 56: pp. 661-669. Sopheak, S. (undat): Vegetable production with emphasis on Chinese cabbage, water spinach, and cassava. Royal University of Agriculture, Chamcar Daung, Phnom Penh, Cambodia. Youdeowei, A. (2002): Integrated pest management practices for the production of roots and tubers and plantains. Integrated Pest Management Extension Guide 3; series editors: A. Cudjoe and M. Braun; Ministry of Food and Agriculture, GTZ and CTA.